Helping to build community and strengthen connections right where people live – in their neighbourhood. Project leaders come together at the end of the cycle (November) to celebrate! The Neighbourhood Small Grants program is open to anyone living in the Hillside –Quadra, Oaklands, Burnside, or North Park neighbourhoods. The Quadra Village Community Centre is the implementing organization of the NSG program, and is operating the program in partnership with the Oaklands Community Association, Burnside Gorge Community Association, and North Park Neighbourhood Association. Youth-led projects are encouraged! Two applicants living in the neighbourhood but from different households are required on every application. Both applicants are responsible for managing the grant money. An applicant can apply for one Neighbourhood Small Grants project per year. Co-applicants can only be used on two applications. Your project must be free, accessible and welcoming to all. You may not charge entrance fees, request donations, or fundraise for other projects and/or organizations. You must begin your project after the grant decision is made. Projects are not supported retroactively. Preference will be given to new projects or those that have been funded for fewer than three years in a row. While some projects may continue year-round, it is expected that your grant is spent by November 15. Projects taking place outside of the participating neighbourhood. Projects with only one applicant or with two applicants from the same household (two applicants living in the same neighbourhood but from different households are required on each application). Projects where you are charging entrance fees, requesting donations, or fundraising for other projects. Projects where you profit financially. Organizations or businesses (these grants are specifically for individuals). Except for community gardens, projects involving infrastructure building or upgrading or purchasing of large equipment such as computers are not eligible. Projects involving therapy and counseling support. Projects must follow municipal by-laws. You must obtain appropriate permits and liability insurance prior to your project start date. Please contact Alex Norfolk, NSG Coordinator, for details. Grant requests must be under $500. Grant money may be used to pay people for services (also called honorariums) to help with the project. An example may be a carpenter or face painter. Total honorarium(s) may not be more than $100 per project. When creating a project budget, you should determine the actual cost of items to be used, and think resourcefully about how to obtain materials through borrowing or donations. You are responsible for keeping expense receipts to account for all project costs. Grant decisions are made by community members living in your neighbourhood. The Neighbourhood Small Grants Committee, made up of neighbourhood volunteers from diverse backgrounds and life experiences, reviews applications and decides which projects to fund. If you would like to get involved in the Neighbourhood Small Grants Committee, please contact Alex Norfolk, NSG Coordinator. Applying for a Neighbourhood Small Grant is easy via our online application system. Note that the online application system is through our partner, the Vancouver Foundation: you will be forwarded to the Vancouver Foundation’s website to complete and submit your application. Once you apply, you will receive an email confirming your application has been received, and will hear back regarding the status of your application three to four weeks after the application deadline. Cheques will be issued in mid-May and projects can get underway. Projects must be completed by November 15. The Vancouver Foundation is Canada’s largest community foundation, working throughout British Columbia to harness the gifts of ideas, money, time and energy to build a lasting legacy of healthy, vibrant and livable communities. A co-funder of Victoria’s Neighbourhood Small Grants program, the Vancouver Foundation provides support and guidance to Neighbourhood Small Grants programs in 17 communities across the province. The Quadra Village Community Centre is a safe and welcoming gathering place that has served the vibrant and diverse neighbourhood of Hillside Quadra since 1974. The Centre works to nurture community well-being by providing services and programs to meet the social, educational, health, employment, environmental and recreational needs of people in the heart of the city. The Burnside Gorge Community Association provides a continuum of high quality programs and supports that strengthen the lives of children, youth and families throughout the Capital Region. Programming includes a range of childcare programs for ages 3.5 to 11 years; a range of community and school-based youth and family services; housing and asset development supports for youth and families; community recreation and special events for all ages; and a variety of community development initiatives. The Oaklands Community Association operates the Oaklands Community Centre and the Oaklands Neighbourhood House. Their vision is to provide a welcoming, engaging, sustainable community where all members can live, learn and thrive. They offer farmers’ markets, recreation and fitness programs, community learning and social events, and a variety of child and youth programs including a child care centre. 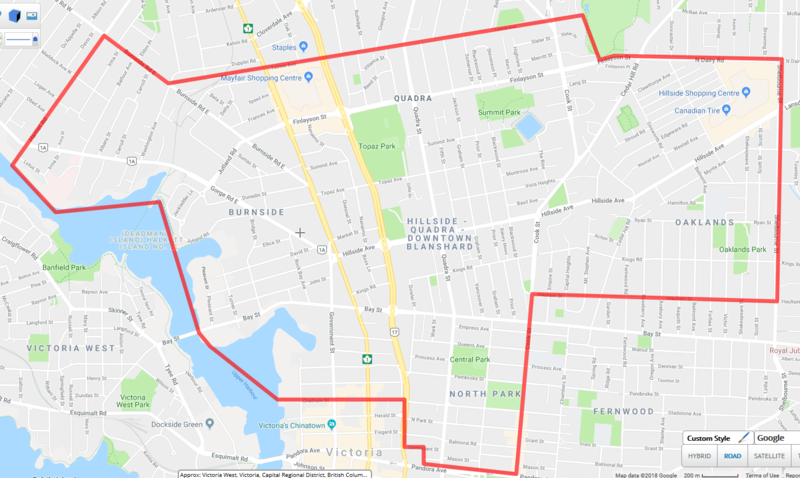 The North Park Neighbourhood Association is a non-profit society that plays an active role in improving the quality of life of people in this downtown neighbourhood. With the support of the City of Victoria and many wonderful volunteers, this Association provides monthly meetings at which individuals can voice views about community matters, and operates sub-committees, including around land use, events, and public art.